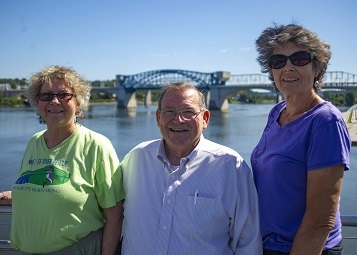 Nancy Brice, Larry Clark and Christine Hunt have been organizing and participating in Tennessee River Rescue since 1988. On Saturday, Oct. 6 they will celebrate 30 years of volunteerism to help improve the health of local waterways. In the fall of 1988, Nancy Brice, Larry Clark and Christine Hunt had no idea what they were starting, and no way to envision the impact of what was — at the time — a tiny volunteer effort. Their plan to address the situation, the inaugural Tennessee River Rescue, was modeled after a successful shoreline cleanup effort in Louisiana. That first year, the volunteers had their work cut out for them covering two zones in two days. Mr. Clark joined the first Tennessee River Rescue by organizing a group of TVA employees to clean a stretch of the river on Nickajack Lake. From 1988 to 2001, he inspired a small army to join the effort, including high school students from Marion County and South Pittsburg. “By 2001, we had more than 100 volunteers in that zone alone,” he says. Now in its 30th year, Mr. Clark continues to contribute to the River Rescue and now leads the East Ridge cleanup zone. Since 2002, volunteers in that zone have improved conditions around Camp Jordan and Spring Creek. Nancy Brice’s involvement in the Rescue began while she was working for the Chattanooga Nature Center. The first year her team collected items from the banks of Cummings Bottom by canoe, transferring the items to a motorboat for removal to a dumpster. By the end of an entire day of trips “from sunrise to sunset,” they collected 56 tires. On Saturday, Oct. 6, this trio of water warriors will celebrate the remarkable milestone of participating in their 30th Tennessee River Rescue. While it sprang forth from humble beginnings, the cleanup has produced lasting results and now engages more than 800 volunteers a year from Bradley, Hamilton and Marion counties. Security cameras, crack downs on illegal dumping, and years of Tennessee River Rescue volunteerism and awareness are making a difference in the health of area rivers and streams. Even though she’s not seeing as many big items — furniture, appliances, tires, and mattresses — along the river, Ms. Hunt cautions that a recent threat is growing whose impact could be just as devastating, if more invisibly. After 30 years of cleanups, Mr. Clark is perhaps most proud of creating a spirit of community pride in caring for the environment. The 30th annual Tennessee River Rescue is Saturday, Oct. 6, from 9 a.m.-1 p.m. For zone locations and information on volunteering, visit tennesseeriverrescue.org or “like” Tennessee River Rescue on Facebook.